Australian Opal Doublet Cabs Oval, 4 x 6 mm. 0.30 ct. Doublet Opal A doublet opal is not a sol..
Australian Opal Doublet Cabs Oval, 5 x 7 mm. 0.42 ct. Doublet Opal A doublet opal is not a sol..
Australian Opal Doublet Cabs Oval, 6 x 8 mm. 0.60 ct. Doublet Opal A doublet opal is not a sol..
Australian Opal Doublet Cabs Round, 4 mm. 0.21 ct. Doublet Opal A doublet opal is not a solid ..
Australian Opal Doublet Cabs Round, 5 mm. 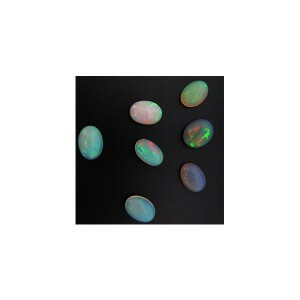 0.30 ct. Doublet Opal A doublet opal is not a solid ..
Ethiopian Opal Cabs, Oval, 10mm x 12mm. ..
Ethiopian Opal Cabs, Oval, 10mm x 14mm. ..
Ethiopian Opal mixed Cabs. Please contact us before the purchase, because sizes and shapes vary,&nbs..